I’ve got a massive laundry to do and then I’m done. At that point I will read magazines, watch tv, eat bon-bons (fruit and nuts actually, and some dark chocolate) and sing to my cats. I brought my camera to a Halloween party last night, but never brought it out, so here is a picture from the days when the weather was opposite to the combo monsoon/blizzard we had last night. 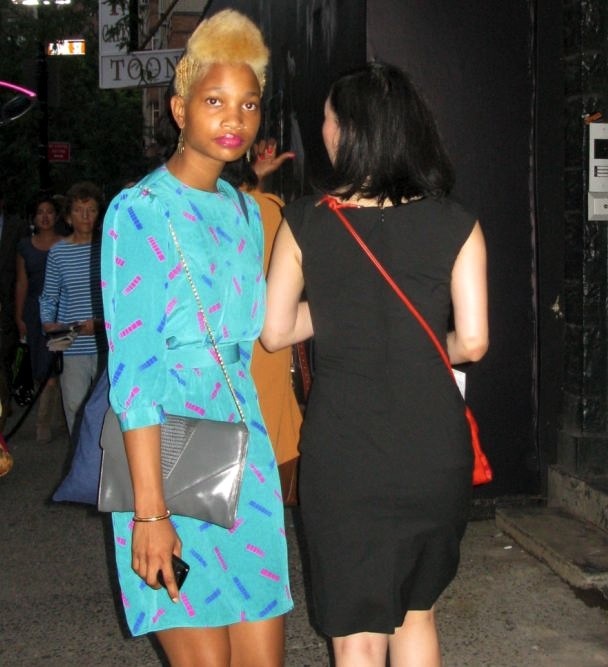 This was from this year’s Fashion’s Night Out. OH! Speaking of which, I love Anya, but Joshua should have won Project Runway, with Victor coming in second and Kimberly coming in third. I was shocked that Anya won. I would kill for pieces in all their collections but hers. Her dresses were beautiful, but there was no variety and I’d have no place to wear any of them. How many people go to resorts?? Also, I’ve been meaning to bring this up, but when a piece is praised because of the print and the print is someone else’s work, it almost feels like cheating to me. Her dresses moved beautifully, I’m not trying to take that away from Anya, but the prints were someone else’s design. Unlike Victor, for instance. Anya is wonderful and Joshua needs to grow up, but still. Last, I love the new show Project Accessory. It made me feel like if I had some talent I could look fabulous even though I’m poor. The accessories they made out of junk, basically??? Amazing! I hope that dark chocolate is Fair Trade chocolate. Divine is fair traded and very good.